In October 1940, Benito Mussolini, the fascist dictator of Italy, backed by Germany, demanded to invade and occupy Greece requesting Greece to surrender. General Ioannis Metaxas famously responded “Ochi!” – “No!” in Greek. 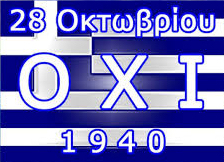 That “No!” in October 28, 1940 brought Greece into the war on the side of the Allies. Indeed, for a period, Greece was Britain’s only ally against Hitler. Not only did Greece rebuke Mussolini’s demands, but seized the offensive and drove the Italians back through most of Albania. Had Metaxas not said “No!”, it’s arguable that the Second World War may have lasted much longer, most possible in favor of the axis, thus having a much different world right now. Historians argue that if Greece had surrendered without any resistance, it would have enabled Hitler to have invaded Russia in the spring, rather than his disastrous attempt to take it during winter.